Crucial Part of the oddly shaped Eurasian chessboard? Last week, the new U.S. Congress convened for its first session. The newly-elected Republicans and Tea Party favourites started the new year with a stunt: reading the complete U.S. Constitution, that semi-sacrosanct document of yesteryear many swear by but few appear to know . . . On the sidelines, another somewhat overlooked speech took place as well. California Democrat Congresswoman Lynn Woolsey took the floor for a short address. Woolsey is the co-chair of the Congressional Progressive Caucus, and gained notoriety as a result of her outspoken stance on the war in Iraq. She was one of the 133 members of the House who voted against authorizing the invasion of Iraq on October 10, 2002. Since then Woolsey has taken an active role in urging U.S. troop withdrawal from Iraq, and has been a vocal critic of the Bush administration’s foreign policy. Last week, however, Lynn Woolsey showed that she was beyond party politics in criticising America’s active military involvement in the Hindu Kush mountains and Afghanistan: “This war represents an epic failure, a national embarrassment, and a moral blight on our nation”. In contrast to Woolsey’s words, the White House appears to view the war in Afghanistan in quite different terms. In the first half of December 2010, it released a new report on America’s war in the Hindu Kush mountains, publishing a 5-page summary for public consumption: Overview of the Afghanistan and Pakistan Annual Review. The short document shows that the Obama administration remains beholden to the Bush rationale for the war saying that the “core goal of the U.S. strategy in the Afghanistan and Pakistan theater remains to disrupt, dismantle, and eventually defeat al-Qa’ida in the region and to prevent its return to either country”. Repeating President Obama’s alliterative mantra, the White House presents the hostilities in Afghanistan as part of the War-on-Terror meant to safeguard the U.S. homeland as well as the rest of the Free World. Rather than taking account of the reality on the ground that sees U.S. and ISAF troops battling “insurgency” or rather resistance fighters known as Taliban, the White House document continues to portray the enemy as al-Qa’ida, a shadowy network of Islamist terrorists bent on destroying the Free World. But already in December 2009, a senior U.S. intelligence official told ABC News that there were only about 100 al-Qa’ida members left in Afghanistan, basing himself on the conclusions of American intelligence agencies and the U.S. Defense Department. In June 2010, CIA director Leon Panetta went a step further, telling ABC News: “I think at most, we’re looking at maybe 50 to 100, maybe less. It’s in that vicinity. There’s no question that the main location of al-Qaeda is in tribal areas of Pakistan”. As a result, the Overview of the Afghanistan and Pakistan Annual Review now confidently talks of the “Pakistan-based leadership and cadre of al-Qa’ida”, thereby offering justification for the U.S. drone attacks in Pakistani territory. But the Pakistani army has for the past years been fighting the Pakistani Taliban (TTP or Tehrik-i-Taliban Pakistan) in the tribal areas bordering Afghanistan who, in response, have unleashed a campaign of terror throughout the whole country. The Obama administration seems adamant to stay the course, having recently committed “1,400 more Marine combat forces to Afghanistan”, as reported by the Associated Press on 6 January. In a way, the War-on-Terror, renamed the Overseas Contingency Operations, is the 21st-century incarnation of the 20th-century Cold War that saw many proxy conflicts and an escalating nuclear arms’ build-up (the could only have led to MAD or Mutually Assured Destruction). As I have indicated in an earlier piece, the NATO establishment already predicted, or maybe rather presaged, such a development in the mid-1990s. Then-NATO secretary-general Willy Claes at the time said that “Islamic militancy has emerged as perhaps the single gravest threat to the NATO alliance and to Western security”. In the absence of a Soviet threat, the Obama administration has now declared al-Qa’ida and its by now more than legendary and possibly defunct leader Osama bin Laden to be America’s main military adversary. While making sure not to declare an outright Crusade against Islam and Muslims worldwide, President Obama continues Cold War policies that ensure that the “military-industrial complex”, to use President Eisenhower’s famous 1961 phrase, is kept busy, happy, and well-fed. Quite some time ago, the independent journalist Pepe Escobar declared that “Osama bin Laden may be dead or not. ‘Al-Qa’ida’ remains a catch-all ghost entity”. In other words, his contention is that the name al-Qa’ida is used by the U.S. to suggest the presence of a threat that is then employed to justify military intervention. The flipside of that stance is now that terrorists and like-minded individuals opposing U.S. dominance and interventionism equally cite the name al-Qa’ida to gain credibility, notoriety, and media exposure. 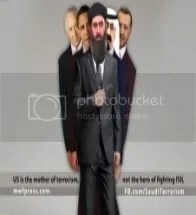 But does al-Qa’ida as a worldwide terrorist network aiming to deceive, disrupt and destroy the Free World really exist? Already in 2004, the British film-maker and writer Adam Curtis suggested in his documentary The Power of Nightmares that al-Qa’ida as an international terrorist network was basically an American invention to secure the prosecution and conviction of guilty parties and individuals in the wake of the 9/11 attacks. As such, even the guilt of Osama bin Laden, as the true instigator of the “9/11” attacks, arguably also remains a somewhat open question. On 28 September 2001, Bin Laden was interviewed by the Urdu-language Pakistani daily Ummat: “I have already said that I am not involved in the 11 September attacks in the United States. As a Muslim, I try my best to avoid telling a lie. I had no knowledge of these attacks, nor do I consider the killing of innocent women, children and other humans as an appreciable act. Islam strictly forbids causing harm to innocent women, children and other people. Such a practice is forbidden even in the course of a battle . . . Whoever committed the act of 11 September are not the friends of the American people. I have already said that we are against the American system, not against its people, whereas in these attacks, the common American people have been killed”. Was Osama bin Laden merely trying to deflect attention and building up an alibi against a possible U.S. attack? As for the famous video confession so conveniently stumbled upon in the Afghan city of Jalalabad in November 2001, the theologian-turned-9/11-debunker Prof. David Ray Griffin maintains that “bin Laden experts have called this later video a fake, and for good reasons. Many of the physical features of the man in this video are different from those of Osama bin Laden (as seen in undoubtedly authentic videos)”. The fact that the FBI last year used an image of the Spanish lawmaker Gaspar Llamazares to create an up-to-date picture of an aging Osama bin Laden proves that U.S. institutions do indeed dabble in creating fakes and make-believes. The incredible story of the digitally enhanced image of Bin Laden using Llamazares’ “hair and facial wrinkles” was broken by the Associated Press. President Obama entered the world stage on an unprecedented wave of goodwill and optimism, relying on his message of “change we can believe in” to affect a serious alteration in the way the U.S. conducts foreign policy and treats other nations. Now that he has been in office for two years, disappointment and disillusion in his actual track record seem widespread. Obama’s continuation of the Bush administration’s championing of the TAPI pipeline project, that would Turkmenistan and India, and his seeming reliance upon Brzezinski’s legacy in pursuing the New Great Game on the “oddly shaped Eurasian chessboard” have transformed him into a proponent of a New Cold War against Islamic Extremism, as personified by al-Qa’ida. Even though many Conservative and Tea Party Obama opponents have cast doubt upon the U.S. President’s religious and political affiliation, referring to him variously as a Nazi-Socialist-Communist-Muslim, his grounding in the Christian faith remains beyond doubt. In particular, Barack Obama is much attached to the work of the American Protestant exponent of “Christian realism,” Reinhold Niebuhr’ (1892-1971). Back in April 2007, then-Candidate Obama told the New York Times columnist David Brooks: “I take away [from Niebuhr’s work] the compelling idea that there’s serious evil in the world, and hardship and pain. And we should be humble and modest in our belief we can eliminate those things. But we shouldn’t use that as an excuse for cynicism and inaction. I take away . . . the sense we have to make these efforts knowing they are hard, and not swinging from naïve idealism to bitter realism”. And now in 2011, Obama is not wavering in the face of evil as personified by al-Qa’ida, present in the Af-Pak Theatre and providing the U.S. with a pertinent reason to stay the course. During the Cold War, Niebuhr was a public intellectual, or rather theologian, who took an active part in the fight, as a virulent defender of the U.S. and an outspoken opponent of the Communist threat. He regarded Communism as a position claiming “to embody a social system in which [the] miracle [of achieving an ideal society] has actually taken place”, a society where a “’vanguard’ of ‘class-conscious’ workers, the members of the Communist Party, whose purposes were so identical with the very purposes of history that every weapon became morally permissible to them and every vicissitude of history was expected to contribute to the inevitability of their victory”. Niebuhr’s words appear easily applicable to the 21st century, one would only need to replace the words Communist Party and Communism with the terms al-Qa’ida and Muslim extremism. Politicians and newscasters alike continuously remind the public that al-Qa’ida wants to turn the world into an Islamic welfare state ruled by a new and all-encompassing Caliphate, “a social system in which [the] miracle [of Islamic providence or Shariah] has actually taken place”. Al-Qa’ida operatives are 21st-century versions of “members of the Communist Party”, who were bent on undermining and ultimately destroying the Capitalist world in the 20th century. President Obama proves to be a crafty proponent of ‘Niebuhrianism’, which Harry R. Davis and Robert C. Good define as a “constellation of perspectives, Biblically derived and validated by experience”. As a Christian Realist, the U.S. President is fighting the “good fight” in the Af-Pak Theatre, while keeping a close eye on China, the new superpower in the making. On Monday, 10 January, U.S. Defense Secretary Robert Gates went to Beijing to “begin regular strategic security talks” between the U.S. and China, a year after the latter cut military ties in protest to American arms sales to Taiwan. Gates stated that military relations between the world’s two biggest economies shouldn’t be “subject to shifting political winds”. Even while the U.S. is busy opposing China on the “oddly shaped Eurasian chessboard”, pitching the TAPI natural gas pipeline project against the Kazakhstan–China oil pipeline connecting the Caspian shore to Xinjiang in Wild West China, President Obama is easing the climate for Chinese President Hu Jintao’s planned trip to Washington, D.C. later this month. Last year, the writer and historian Ryan Shaffer put forward that “Bangladeshi atheists and secularists are under attack from their government and Muslim extremists. In the last year, several leading Bangladeshi secularists have been murdered. In late 2014 and early 2015, four vocal professors, authors, and bloggers were killed by extremists by being hacked to death in public. The first murder was of Shafiul Islam, who was killed by several machete-wielding men near his home following allegations that he banned women from wearing burkas in his university classes. Then Avijit Roy, a Bangladeshi American writer who was critical of Islam, was attacked by three men with machetes and died at a nearby hospital from his injuries. Lastly, Oyasiqur Rahman and Ananta Bijoy Das, both atheist bloggers, were killed by assailants with machetes in separate but nearly identical attacks. These murders are just the latest in a campaign against atheists in Bangladesh. Since the 2013 murder of Ahmed Rajib Haider, another blogger who criticized Islam, the Bangladeshi government has walked a fine line between safeguarding its official religion of Islam and trying to protect nonbelievers from violent Islamic extremists”. In early 2014, AFP reported that “Bangladesh police have charged seven students of an elite university and a cleric over the murder of an allegedly atheist blogger who was critical of Islam and Islamic groups. The students are accused of hacking to death Ahmed Rajib Haider, 35, near his home in Dhaka in February , days after he helped launch a campaign against Islamist leaders accused of war crimes. Police also charged an imam from a Dhaka mosque with instigating the murder by allegedly preaching that it was legal to kill atheist bloggers who campaigned against Islam”. The situation in East Bengal seems to be very dire indeed. The report goes on to say that the “body of Haider, better known by his Bengali online identity Thaba Baba, was found with hatchet wounds to the head in what police said was an apparent attempt to behead him. Six out of the seven men — all of whom are students of the prestigious and private North South University — and the imam have been arrested and are being held in jail, [Dhaka police deputy commissioner Masudur Rahman] said. Haider’s killing was the second attack in Dhaka against bloggers critical of Islam, after the stabbing of a self-styled ‘militant atheist’ by three unidentified men in January . After Haider’s death, Bangladesh’s Islamic parties started to protest against other campaigning bloggers, calling a series of nationwide strikes to demand their execution, accusing them of blasphemy”. Giving a little potted history, Shaffer explains that “Bangladesh has its origins in religious strife and sectarianism. It gained its independence in 1947 when British India was divided to create a separate Muslim land. Originally founded as a Muslim-nation called East Pakistan, the country underwent a devastating ‘war of liberation’ against West Pakistan in 1971 and became Bangladesh, a nation of Bengalis. Though the country has a secular democracy, Islam is the official state religion and Muslim political parties play significant roles in crafting laws and influencing prosecutions. However, the current ruling party is the Awami League, a left-leaning secular socialist party [in power since 2009], and the prime minister is Sheikh Hasina, a woman who also governed the country from 1996 to 2001. Bangladesh’s recent history has been marked by corruption, assassinations, and arrests of political rivals, including Hasina’s 2008 indictment for extortion. At the same time, Muslim extremism has cast a large shadow with terrorist attacks killing and injuring large numbers of people, most notably two dozen deaths and hundreds of injuries following Hasina’s public anti-terror speech in 2004. Indeed, the country has weak governance and vocal religious extremists, which is further complicated by poverty and terrorism. Politicians have used Islam as a wedge for broadening its appeal and tapping into populist support for the nation’s official religion. Specifically, the government has been pursuing atheists and humanists for “hate speech” over their online posts critical of Islam”. The Bangladeshi Constitution proclaims that the country “is a unitary, independent, sovereign Republic to be known as the People’s Republic of Bangladesh” (Article 1). The document then goes on to state that “[t]he state religion of the Republic is Islam, but other religions may be practiced in peace and harmony in the Republic” (Article 2.A). And driving home the point, the document also points out that “[t]he principles of absolute trust and faith in the Almighty Allah, nationalism, democracy and socialism meaning economic and social justice, together with the principles derived from them as set out in this Part [of the Constitution], shall constitute the fundamental principles of state policy” (Article 8.1) and that “[a]bsolute trust and faith in the Almighty Allah shall be the basis of all actions” (Article 8.1A). As a result, it seems that the Bangladeshi mind is bound to be somewhat confused and muddled, as the Almighty Allah is the driving force behind “nationalism, democracy and socialism” in East Bengal . . .
 Ryan Shaffer, “Crisis in Bangladesh: Secularists Killed by Extremists and Under Legal Threat from Government” Council for Secular Humanism (02 June 2015). https://www.secularhumanism.org/index.php/articles/7551. “Cleric, students charged with ‘athesist’ blogger’s murder” AFP (29 January 2014). http://www.9news.com.au/world/2014/01/29/07/48/cleric-students-charged-with-atheist-blogger-s-murder#eDrLKJjuBtEuGOqO.99. “Cleric, students charged with ‘athesist’ blogger’s murder”. Ryan Shaffer, “Crisis in Bangladesh: Secularists Killed by Extremists and Under Legal Threat from Government”. “CONSTITUTION OF THE PEOPLE’S REPUBLIC OF BANGLADESH” International Relations and Security Network. http://www1.umn.edu/humanrts/research/bangladesh-constitution.pdf. “CONSTITUTION OF THE PEOPLE’S REPUBLIC OF BANGLADESH”. ‘Prabir Purkayastha tells Paul Jay that the fulcrum of U.S. military policies in the region is at one end Saudi Arabia and Israel, and the other is Pakistan – ISIS is a product of the failed policies of this alliance (3 Feb 2015)’. 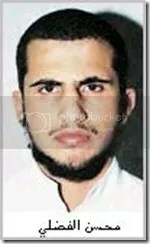 The Khorasan Group or Who is Muhsin al-Fadhli??? The economics and politics writer Tim Fernholz, on the ‘digitally native news outlet’ that is Quartz, established in 2012 by Atlantic for ‘business people in the new global economy’, confides that “US intelligence officials have spent the last week dropping hints about another al Qaeda off-shoot that does aim to attack Western countries at home, and it operates in ISIL’s backyard. The organization is known as ‘the Khorasan group’, a reference to a historic territory encompassing modern Afghanistan and Iran. Like ISIL, it has has roots in al Qaeda, but unlike the militants attempting to seize territory in Iraq and Syria, the Khorasan group is still within al Qaeda’s hierarchy and focused on terror attacks in the West”. Now that the Islamic State (or ISIL or ISIS, if you will) has finally emerged as the West’s new bogeyman, it turns out that America is not content and feels the need to come up with yet another one for good measure . . . Fernholz continues that the “US director of national intelligence, James Clapper, said this group [. that would be the Khorasan group] could be a more direct threat than ISIL and mentioned the leader’s name publicly for the first time: Muhsin al-Fadhli, a Kuwaiti who was a 20-year-old member of Osama bin Laden’s inner circle at the time of the 9/11 attacks. By 2012, he was al Qaeda’s top man in Iran, financing terror operations in Iraq as a go-between for Gulf state donors, and earning a $7-million price on his head from the US. According to [a] CIA source who spoke with the New York Times following Clapper’s revelation, the now-33-year-old al-Fadhli is working with a cell of Afghan and Pakistani fighters in Syria to recruit Muslim extremists with US and European passports for attacks in their home countries. His organization is collaborating with al Qaeda in the Arabian Peninsula, the Yemeni offshoot of the extremist movement that has a reputation for attempts at sophisticated bomb-making designed to slip explosives past airport security procedures. Three have made it onto airplanes, but none of the plots have succeeded. It’s not clear why intelligence officials chose to reveal their concerns about the Khorasan group now. Some in the US government have been accused of exaggerating the threat of ISIL to the United States, but these revelations are a reminder that some of its ideological siblings are still focused on attacks in the West”. Does this mean that the U.S. does not see the Islamic State as a direct enough threat to America??? According to Thomas Joscelyn, a senior fellow at the Foundation for Defense of Democracies (a neoconservative Washington-based think tank) and writing about five months ago, “Muhsin al Fadhli, a senior al Qaeda leader who once headed the organization’s network in Iran, relocated to Syria in mid-2013, according to a report in The Arab Times on March 21 [, 2014]. Citing anonymous sources, the publication reports that al Fadhli has joined the Al Nusrah Front, al Qaeda’s official branch in Syria. He was apparently sent to the country after a dispute broke out between Al Nusrah and the Islamic State of Iraq and the Sham (ISIS). Al Fadhli was one of the trusted operatives who reported back to Ayman al Zawahiri on the dispute, according to the Arab Times, and he influenced al Qaeda’s decision to eventually disown ISIS. Today, al Fadhli reportedly recruits European Muslims to join the jihad in Syria and ‘trains them on how to execute terror operations in the western countries, focusing mostly on means of public transportation such as trains and airplanes’. The Arab Times account does not identify its sources and parts of it do not ring true. For example, al Fadhli’s ‘four main targets’ inside Syria are supposedly Bashar al Assad’s forces, the Free Syrian Army, the Islamic Front, and ISIS. However, only two of these targets make sense in the current operational environment”. So, it seems the man at the head of the group was an already well-known terrorist, but the name Khorasan Group had not been coined till recently. Joscelyn continues that “Al Fadhli became the leader of al Qaeda’s network inside Iran after a senior al Qaeda leader known as Yasin al Suri was detained by Iranian authorities”. As the good folks of Wikipedia remind us: “Khorasan in its proper sense comprised principally the cities of Balkh, Herat, and Taloqan (now in Afghanistan), Mashhad, Nishapur, and Sabzevar (now in northeastern Iran), Merv and Nisa (now in southern Turkmenistan), and Samarqand and Bukhara (now in Uzbekistan)”. And so it came about that Muhsin al Fadhli suddenly emerged on the scene as the leader of the Khorasan Group, a shadowy, even possibly non-extant organisation, with ‘clear’ links to the bogeyman of yesteryear, Al Qaeda . . . or to employ that nifty Escobarian phrase once more, the name that is a “catch-all ghost entity” . . . And now Obama has once again released genie from the bottle that Junior handled or even prepared in the aftermath of 9/11. Tim Fernholz, “Meet the terror group in Syria that could actually threaten the US” Quartz (22 September 2014). http://qz.com/269198/meet-the-terror-group-in-syria-that-could-actually-threaten-the-us/. Tim Fernholz, “Meet the terror group in Syria that could actually threaten the US”. Thomas Joscelyn, “Report: Former head of al Qaeda’s network in Iran now operates in Syria”. ‘CNN’s Jean Casarez reports on the woman, known as “Lady al Qaeda,” who ISIS wanted to exchange for James Foley (22 August 2014)’. 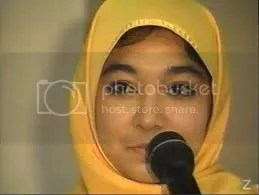 Born in 1972, the Pakistani Aafia Siddiqui went to the United States to study neuroscience. She immigrated to the US in 1990 and obtained a PhD from Brandeis University in 2001. The good people of Wikipedia explain further that in “Siddiqui returned to Pakistan [in 2003 and that]. [i]n March . . . she was named as a courier and financier for al-Qaida by Khalid Sheikh Muhammad and was placed on a “wanted for questioning” list by the FBI. She subsequently disappeared until she was arrested in Ghazni, Afghanistan, with documents and notes for making bombs plus containers of sodium cyanide. Siddiqui was indicted in New York federal district court in September 2008 on charges of attempted murder and assault stemming from an incident in an interview with US authorities in Ghazni, charges which Siddiqui denied. After 18 months in detention, she was tried and convicted in early 2010 and sentenced to 86 years in prison. Throughout the trial, the Pakistani government supported Siddiqui. Her conviction resulted in some protests in Pakistan. Various media reports have also highlighted differences in how the case was portrayed in the US and in Pakistan”. In the Independent, Heather Saul writes that “Islamic State militants reportedly demanded the release of Dr Aafia Siddiqui, a female Pakistani scientist and others extradited to the United States, in exchange for American photojournalist James Foley and other Western hostages. In an email sent to the family of Mr Foley, the militants claimed they had offered “prisoner exchanges to free the Muslims currently in your detention” including Dr Sidiqqui. Dr Sidiqqui, 42, a neuroscientist trained at the Massachusetts Institute of Technology, was arrested in Ghazni, Afghanistan in 2008. She was found to be carrying notes at the time of her arrest that included references to constructing dirty bombs and a list of New York City landmarks, as well as the toxic substance sodium cyanide. While being interrogated by US officials she allegedly grabbed a rifle and opened fire, shouting ‘death to Americans’, according to the BBC. She was sentenced to 86 years in prison after being convicted of attempting to kill US military personnel, sparking protests across Pakistan demanding her release. A petition to the White House also calling for her release has gathered 110,000 signatures in August. She is being held at a prison in Texas”. Heather Saul, “James Foley beading: Isis ‘demanded release’ of female Pakistani scientist Dr Aafia Siddiqui and others in exchange for Western hostages” The Independent (22 August 2014). http://www.independent.co.uk/news/world/middle-east/james-foley-beading-isis-demanded-release-of-female-pakistani-scientist-dr-aafia-siddiqui-and-others-in-exchange-for-western-hostages-9685598.html. 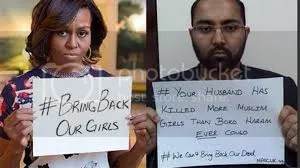 ‘The First Lady’s attempt to put the horror of some 200 school girls taken hostage by the terrorist organization Boko Haram in Nigeria into hashtag. The symbolic social media stunt FAILS and gets fierce feedbac (15 May 2014)’. As days and nights go on without the 200-plus abducted Nigerian girls safely back in their homes, the international community is raising their virtual voices through various viral statements. “Bring back our girls,” director of a division in the United Nations Entity for Gender Equality and the Empowerment of Women ( UN Women), Gulden Turkoz-Cosslett, said . 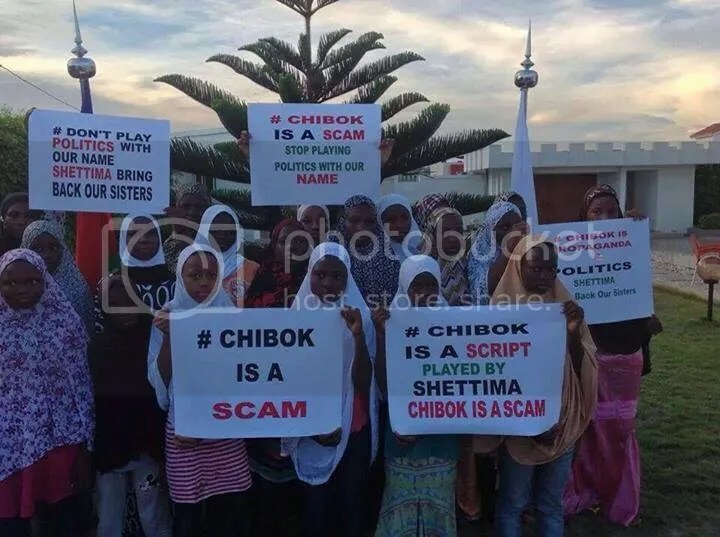 . .
And then are those who say that the whole thing is a scam, as related by the Nigerian journalist Samuel Agada: the ‘Founder of the now rested Niger Delta Peoples Volunteer Force, Alhaji Asari Dokubo has described the hullabaloo generated as a result of the abducted Chibok schoolgirls as a scam’. Samuel Agada, ” No girls are missing, Chibok abduction is a scam – Asari Dokubo” Daily Post (08 May 2014). http://dailypost.ng/2014/05/08/girls-missing-chibok-abduction-scam-asari-dokubo/.